The giant earthquake and tsunami that devastated Japan in March were so strong that their vibrations almost reached space, a new study says. The vertical motion of the ground shaking and swelling tsunami waves produced the vibrations, which pressed upward against the overlying air, said Emile Okal, a geophysicist at Northwestern University who was not part of the study team. This process has been known from previous earthquakes, but the vibrations from Japan caused the biggest such effect yet measured. At ground level, such vibrations—akin to low-frequency sound waves—are very small, only about the size of the vertical motions that produce them. But as the waves travel upward into ever thinner air, they expand, Okal said. At heights where airplanes travel, about 30,000 feet (9,100 meters), Okal said, the waves from the Japan disaster might have expanded to about three feet (one meter) in amplitude, which is the extent at which a vibration travels from its normal state of equilibrium. That's not enough for an air passenger to even feel a bump. But in the upper atmosphere, the ionosphere, the waves were amplified to thousands of times their original sizes, scientists say. 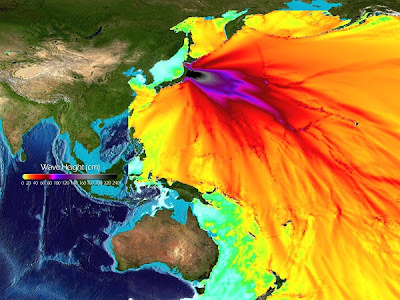 A computer model shows the predicted wave heights of the Japan tsunami moving across the Pacific. Quake Vibrations to Track Tsunamis? The ionosphere is made up of relatively hot gases that are electrically charged due to interactions with intense, high-altitude sunlight. The upward-traveling waves compressed the gases, enough to have detectable effects on radio waves, such as those used for GPS. "If you have extremely precise GPS, you can see" variations in the signal, Okal said. Some scientists have even proposed using such GPS disturbances to track tsunamis in the open sea, Okal added. But he thinks it's unlikely this would be a practical warning system, because only land-based GPS receivers are precise enough to see the changes. By the time the disturbances come within range, the tsunami is practically ashore. More likely to be useful, he said, is a similar effect on over-the-horizon radar, which bounces off the ionosphere to peer beyond the curve of the Earth. "There are people looking into this to possibly develop tsunami warnings," he said.